If you’re a regular reader of this blog (someone must be), or have spent any time with me, you’ll know that I’ve written some comics for Doctor Who Adventures. Being aimed at children and told over a short number of pages, the DWA strips can’t be too complicated or experimental, but must have some kind of hook. You couldn’t, for example, tell the narratively convoluted and politically exploratory story of the Monks’ invasion in a DWA strip. 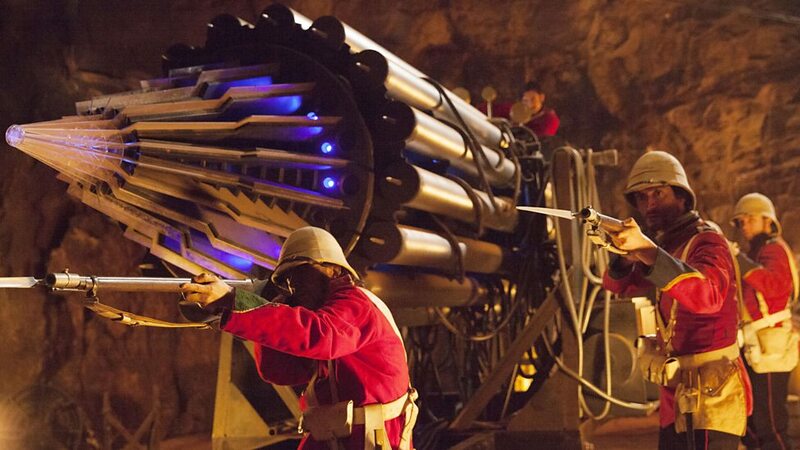 Empress of Mars, however, has a pitch that I would have jumped on if I’d thought of it when brainstorming DWA ideas – Victorian soldiers trapped on Mars with Ice Warriors. It’s a simple pitch but immediately visual, colourful, brimming with story potential, a new twist on the world of Doctor Who yet one that fits in perfectly. Now, I do like how the TV show can do much more than such simplistic stories, and the episodes that set out to push boundaries are often among the best, but frankly, after three weeks of convoluted heaviness, I was all up for this slice of fun. The other thing that stands out about the episode’s concept is how thoroughly Mark Gatiss it is. Stiff upper lip Victorian soldiers with names like Neville Catchlove, monsters from the Pertwee era, a retro adventure feel with the particular influences being Edgar Rice Burroughs and H. G. Wells – all toys in Gatiss’s favourite playpen. He’s generally had more success when he’s been allowed to play around with such toys – see The Crimson Horror – as opposed to when he’s tried newer, more experimental styles – see Sleep No More – so I was hopeful for this one. And to an extent, it’s what I wanted. It’s a pacey adventure with enjoyably heightened characters and clear, precise motivations. It's simply but sturdily plotted; it never tries to deceive, never becomes convoluted. It’s good old-fashioned fun. Plus, unlike the talkative last three episodes, it’s full of action. The direction of these scenes isn’t perfect, possibly due to budget – that climactic shootout relies way too heavily on close-ups and cutaways, meaning there’s no real sense of its geography – but nevertheless, what we want from this story is redcoats shooting it out with Ice Warriors, and that’s what it delivers. 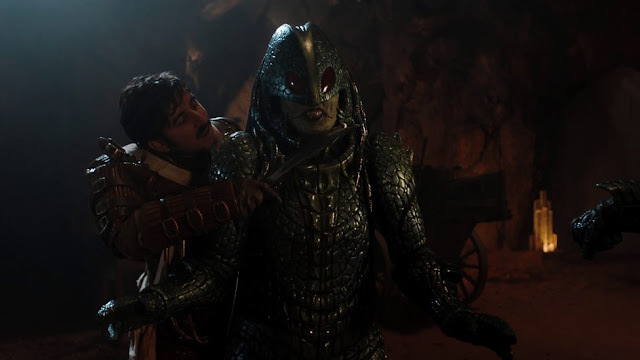 Because of this action adventure feel, Empress of Mars never gets too deep into the theme of imperialism it touches upon and which a more political writer like Peter Harness would take from the concept and run away with. That’s not a criticism, though – after all, it’s never what Gatiss was going to be interested in. What we could have expected more from Gatiss, though, and what is lacking here, is the tongue-in-cheek humour that characterised The Crimson Horror. A few awkwardly crowbarred movie references aside, the dialogue is all very mechanical, and Gatiss plays his Burroughs homages too straight, leaving the episode often feeling dry. It’s also lacking in characterisation. Gatiss has always tended to write the Doctor and companion as very generic, but that’s taken to an extreme here; neither Bill nor the Doctor do much to stand out from the crowd, or even to impact the plot, largely being mere observers of the fantastical adventure going on around them. Some of the soldiers get more depth, but it’s lacking in subtlety; the central ‘redeemed coward versus aggressive usurper’ dynamic is fine for the story the episode wants to tell, if nothing surprising, but what really annoyed me was how obvious the details given to supporting characters are. He has a photo of his fiancée... they’re planning to get married once they’ve found a comfortable place... the village church... so green... you could get a computer to write this. On the plus side: individual alien characters! I’ve been complaining for the past few weeks about how the Monks lack personality, and actually, thinking about it, that applies to every single monster of Series 10 so far, so it’s great that both Friday and Iraxxa have traits which identify them individually as opposed to their entire race, and even have development. Iraxxa starts off as a proud and single-minded warlord and gradually becomes more sympathetic, but it’s Friday who’s really interesting – the old and weary soldier who’s seen both sides of the conflict and has come to the conclusion that he must join the Doctor as an arbiter of peace – and it’s refreshing to see this perspective from one of the aliens. Shame, though, that he’s forgotten about after he’s broken our heroes out of jail; it feels that there was a concluding beat to his story that’s been cut out. 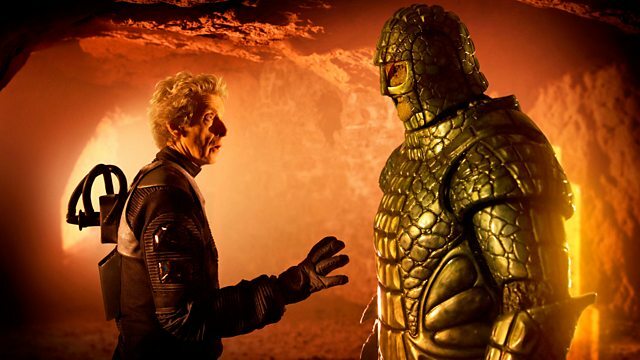 Empress of Mars, then, has enough going for it, in terms of old-fashioned ideas done well and new twists on top of them, to make for an entertaining piece of telly, and it's a relaxing, easy watch compared to the heavy past few weeks. But it’s in many ways unrefined and lacking the real spark that it needs. It’s Mark Gatiss at his most characteristic, but not at his best.